The most comprehensive platform for showcasing your experts with key prospects, media, events and more. Drive visibility for your organization. Stop hiding your talented people. With well-structured content, ExpertFile helps you build greater visibility for your experts and staff in search engines, our online directory and across your website. 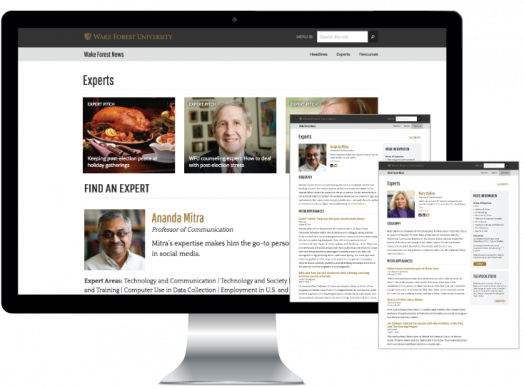 Profile your organization's top thought leaders by aggregating their top content from across the web. Build visibility with hundreds of media outlets and event organizers already using ExpertFile to find leading thought leaders. Drive leads. Let prospects and potential partners know where your organization excels. your visibility with leading newspaper, digital and broadcast outlets throughout the world. Build a branded expert center, speakers bureau, staff directory & more. Organize your people. Build branded directories, profiles and featured content on your website - all without ongoing IT support required. Customize the content, layout and design to match your current website & branding. Create searchable directories for experts and staff with full profiles directly on your website through our easy to use integration tools or full API. Work collaboratively to quickly publish engaging profiles available on your website, discoverable through Google, expertfile.com and more. In just a few clicks, bring profiles to life with video, slides and publications directly from YouTube™, SlideShare™, Amazon™ Books and more. Worry-free integrations with all major content management systems. International Bestselling Author of "The New Rules of Marketing & PR"
In just a couple of minutes get gain a better understanding of all that ExpertFile has to offer. To learn more about our powerful Enterprise capabilities including our "Design Lab" and "Spotlight" features click here. © 2017 ExpertFile, Inc. All Rights Reserved.